Lyme Disease is emerging as a climate-driven pandemic in the United States. According to the Centers for Disease Control and Prevention (CDC), an estimated 300,000 Americans are diagnosed with Lyme disease each year, and the prevalence is rising, even in places where Lyme disease never existed before. Now, healthcare professionals are looking for a reason for the increase in cases. According to the Center for Disease Control (CDC), Lyme disease is now the most commonly reported vectorborne illness in the United States. 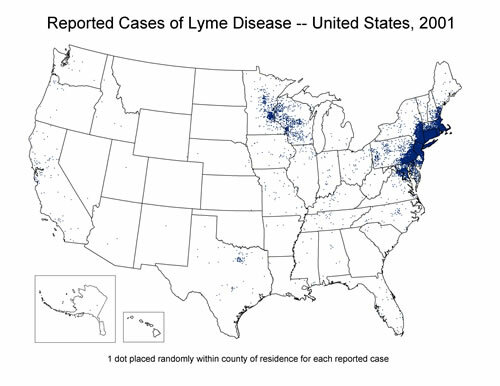 In 2013, it was the fifth most common Nationally Notifiable disease, despite the fact that Lyme disease does not occur nationwide and is concentrated heavily in the northeast and upper Midwest. The similarities between ticks and mosquitos, which are the No. 1 vectors in the world for parasitic diseases, are striking. One causes harm in the tropics while the other spreads disease in temperate zones. One clear factor in the spread of Lyme is that the range of Lyme-carrying ticks is spreading. Is climate change hitting close to home yet? People across the United States are noticing changes all around them. Summers are longer and hotter, and extended periods of unusual heat last longer than anyone living in the US has ever experienced. Winters are generally shorter and warmer and we experience heavier downpours of rain. And now, a long-term study on ticks reveals shifting migration patterns, including the increase of disease risks and scope of infection epicenters. Ticks may be a local hazard, but world-wide disasters are more telling of how the rest of the world is dealing with warming temperatures. Record-setting heat-waves in Pakistan are killing people by the thousands. The city of Bandar Mahshahr, Iran, reaching a heat index of 165ºF—close to an all time record on Earth—and severe droughts in major farming regions across the world. National Parks are catching fire for the first time in living memory, and the Guardian had to briefly pause it’s live blog coverage of the heat-wave because the computer servers were too hot??? Puerto Rico and the Caribbean are under strict water rationing related to the El Niño oscillation. Is the first world finally going to recognize with how we are actively being affected by climate change? The answer is yes, and the disease-spreading tick of the North is going to help, at least where I live. 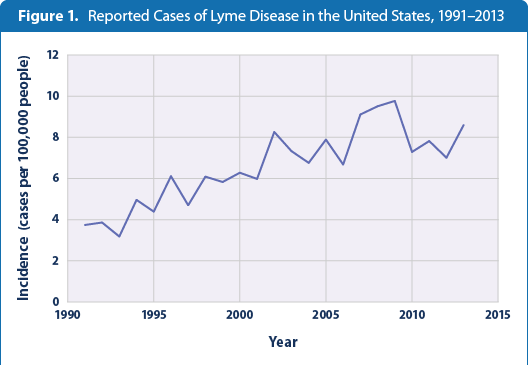 After the 1980s, Lyme disease catapulted onto the Center for Disease Control’s radar, amid growing public demand for information on how to treat and prevent the disease. But now, high doses of antibiotics are no longer a viable solution for chronic sufferers and Lyme is more serious than most people realize. While those who catch it early suffer what feels like a bad flu, others have lifelong complications. More seriously, Lyme can contribute to long-term neurological issues include numbness, pain, and stiffness in the arms and legs, tremors, facial paralysis, and vision problems. Some people have nerve damage, memory problems, and other and even cognitive issues that may turn up years later.and as cases grow, with 50,0000, in the previous year alone. “Just in the past 10 years, we’re seeing things shift considerably,” said Indiana University’s professor Keith Clay who has studied migrational patterns of ticks. “You used to never see lone star ticks in Indiana; now they’re very common. In 10 years, we’re likely to see the Gulf Coast tick here, too. There are several theories for why this is happening, but the big one is climate change. Will US citizens finally understand that climate change impacts them directly? Now that a more serious disease is on their May- June springtime, hiking, recreational doorstep? In a study from 2012, “Global Warming’s Six Americas”, Yale University researchers examined Americans’ beliefs, attitudes, policy preferences and climate-relevant behaviors. The results on perceived benefits and costs of reducing fossil fuel use and global warming emphasized the role health plays in our perceptions of climate change. For Five of the Six Americas, “improved public health now ranks among the top three perceived benefits of the nation taking action to reduce fossil fuel use and global warming.” This report continued to note that citizen activism in support of climate and energy policies is unlikely if individuals believe their representatives will ignore their views. It highlighted collective efficacy, an essential component of civic engagement. I am from the United States, a country where the average person experiences relatively low impacts of climate change compared to those experienced in the global south, even as we contribute greatly to the negative effects experienced by countries worldwide. Some of my friends link intense weather events like Hurricane Sandy or the massive drought in California to climate change, but climate change has remained an abstract buzz-word, used to describe events in other countries or far into the future… until now. I am from Pennsylvania, an area experiencing more cases and complications from ticks. I was recently diagnosed with Lyme disease. Locally, Lyme is my personal link to climate change. With one infection, climate change now affects my quality of life. Will the new climate equalizer be the migration of pathogens and the rate of infectious diseases for those affected by climate change? Will this change the thinking of those that think climate change doesn’t affect them? Many will argue that the effects of climate change are already being felt in the United States. In the past three decades, the percentage of Americans with asthma has more than doubled, and climate change is putting those Americans at greater risk of landing in the hospital. Extreme weather events—from more severe droughts and wildfires in the West to record heat waves and sea level rise—are hitting communities across the country. In fact, 14 of the 15 warmest years on record have all occurred in the first 15 years of this century and last year was the warmest year ever. EVER. The most recent National Climate Assessment summarizes the impacts of climate change on the United States, now and in the future. A team of more than 300 experts guided by a 60-member Federal Advisory Committee produced the report, which was extensively reviewed by the public and experts, including federal agencies and a panel of the National Academy of Sciences. We are told that Climate Change affects people in frontline communities—like those who experience deadly weather, 116 degree heat waves in Iran, and Myanmar, which this week reported the worst flooding across the country in decades. In Western countries Lyme is on the rise as infected ticks emerge from hibernation earlier because of increasing temperatures from global climate change. Climate change is linked to more floods, hotter and drier weather, and melting sea ice, but it could also affect infectious diseases like Lyme disease and West Nile Virus. The problem is… we don’t know yet just how much it will change the rate of disease and infection. If drastic action is not taken, climate impacts have the potential to affect every aspect of our lives, and health will be the rallying call. The connection is clear: the warming climate is causing an uptick in Lyme disease. But, will climate change mean a ticked off American public, as more people are diagnosed? Health matters. The Clean Power Plan, announced on Monday, is unquestionably the most important step the administration has taken in the fight against climate change. It imposes the first nationwide limits on carbon dioxide pollution from power plants, the source of 31 percent of America’s total greenhouse gas emissions. If you have more questions, the New York Times does a good run-down of the plan through 5 FAQs. It is clear that President Barack Obama is now taking “unprecedented action” to combat climate change and that “no challenge poses a greater threat to our future and future generations than a change in climate”. His plan is health-focused and aims to reduce pollution from coal-fired plants which will actively prevent 3,600 premature deaths annually, lead to 90,000 fewer asthma attacks in children, and prevent 300,000 missed work and school days. one in six black kids and one in nine Latino children has asthma. Seventy-eight percent of African-Americans live within 30 miles of a dirty, polluting coal plant. African-Americans are also more likely to live in coastal areas and die during heat waves. Social justice issues, which are climate justice issues, even in the industrialized world, have found their way into federal policy. #thanksObama. Obama’s stance is clear, “Climate change is not a problem for another generation.” This is a win for our health. This is a win for our climate. This is a win for all future generations. The Clean Power Plan represents healthier air for American communities, a safer climate for current and future generations, and helps build momentum for a global response to this challenge. Catherine Thomassan, Executive Director of Physicians for Social Responsibility has called climate change “the greatest threat to public health of this century”. Watts also identifies health as “the great localiser of the impacts of Climate Change.” He goes on to say that climate change is no longer just for low-income countries, but is going to impact middle and high income countries as well. That means me. My health, and my way of life. Lyme disease is my climate change localiser. ‘Lyme disease is not only becoming more rampant in its normal hotspot of the northeast United States, it’s spreading across the country,’ a new report from the Centers for Disease Control and Prevention warns. ‘Over time, the number of counties identified as having high incidence of Lyme disease in the northeastern states increased more than 320 percent,’ researchers write in the report. They also note that the disease is appearing in states where it has never been recorded before. The threat is spreading. It has appeared on the West Coast, particularly in Northern California, range maps show. Lyme disease travels well, with cases reported in new areas, moving west and south. Researchers at the Cary Institute of Ecosystem Studies in Millbrook, New York, (ground zero for Lyme disease) looked at almost 20 years of data and concluded that ticks are emerging from their winter sleep earlier. Ticks are adapting to climate change and are also changing their reproductive cycle as a result of warming temperatures. “Ticks are emerging earlier as the climate warms—as much as three weeks earlier in warmer years,” said Richard Ostfeld, a Cary Institute disease ecologist and coauthor of the research on migrational patterns of ticks. Global climate change contributes to changing weather patterns in more ways than we care to admit. Biological cycles are off with plants blooming sooner and hibernating animals who just can’t get their sleep on. Now, the tiny, black deer tick is emerging sooner and faster than previously recorded. And they are biting and infecting across a wider range than before. #thanksClimateChange. If this persists, we will need to move Lyme Disease Awareness Month from May to April. Extreme weather in recent months has proven deadly for those most vulnerable. But at the same time we have a better understanding of how the drivers of climate change are having significant impacts on our personal health. Climate issues aren’t just global, they’re personal.